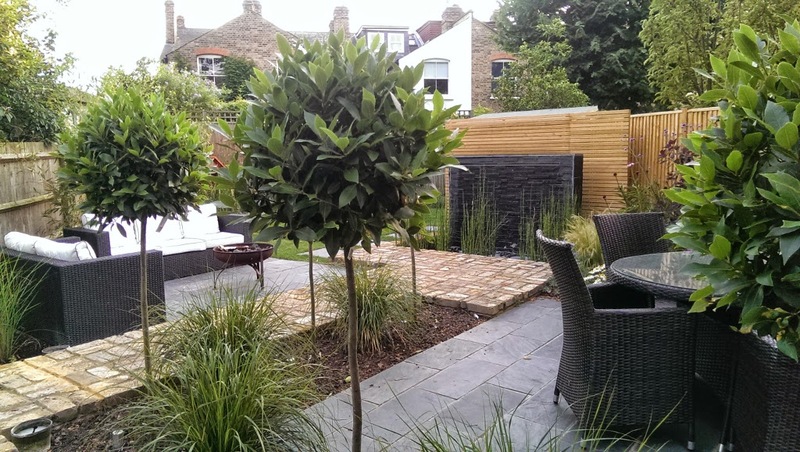 Following extensive house refurbishment Scott Lawrence Garden Design were contacted to provide this design in Richmond Upon Thames. The previous garden offered little in the way of places to sit and enjoy the space around. The pictures taken are just after planting. Within a season or two the different areas will become more defined and offer a sense of privacy and charm. Approx size : 22m x 9m. 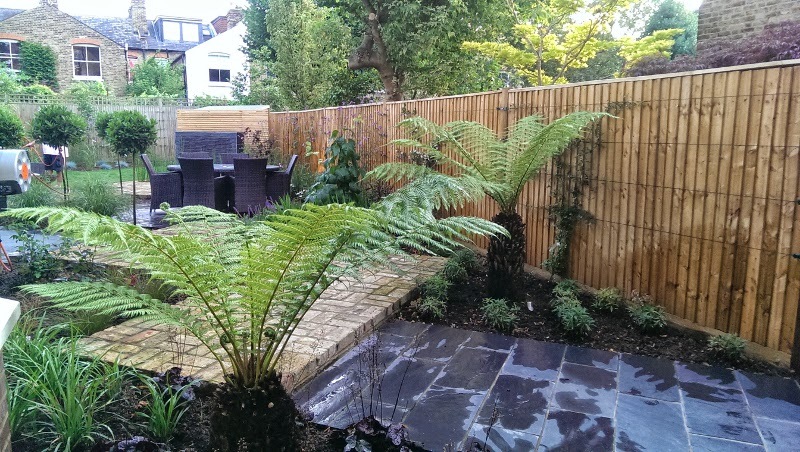 The clients, a professional couple working long hours needed a garden they could entertain in, enjoy an evening fire, have a home the dog could retreat into and a water feature. 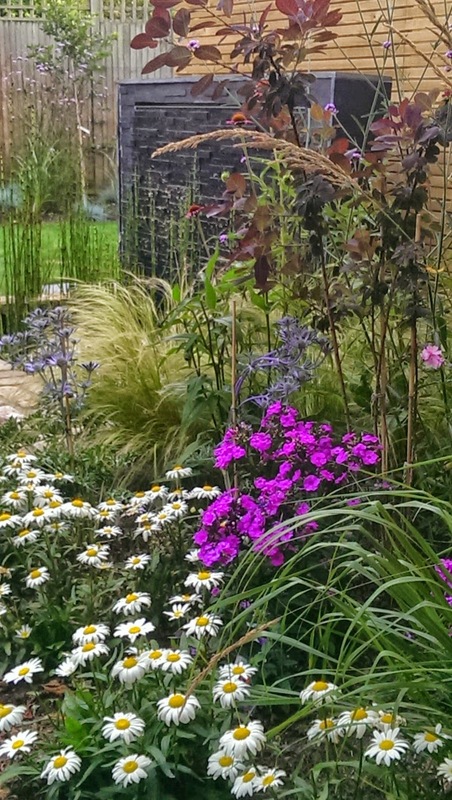 The planting to be interesting, colourful and low maintenance. To create the different areas of enjoyment and to make the garden feel larger the garden was designed on a 45 degree axis to the house. Designing in this layout style it provides the opportunity to separate different areas , often divided by plants, that give the feeling of enclosure in each area but linked together through paths and walkways. Several old sections of London stock walling were removed for the design. Rather than see these bricks be disposed of they were used as the pathways to link the areas together as well as working in harmony with the stock brick house. The client had received a Kadai as a gift (see further pictures below) which worked perfectly in the new fire / relaxing area. Being a garden design with generous space to utilise, the new design features a morning coffee area. The placement chosen for its location next to the house, the position of which also receives the morning sun, perfect for catching some rays before heading to the office. A raised herb garden was also constructed as the client is an avid cook. 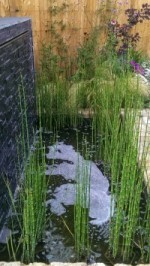 The focal point for this garden design is the water feature. Carefully positioned in the new design so it can be viewed from all the areas of enjoyment. Offering year round movement, interest and tranquility. A water feature is also very good at dampening the effect of noise pollution called by air and London street traffic. 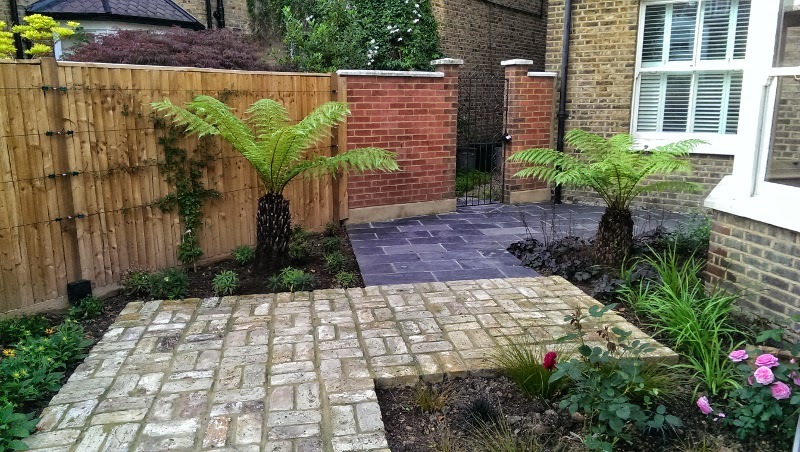 This feature was constructed from a stacked slate to match the paving. 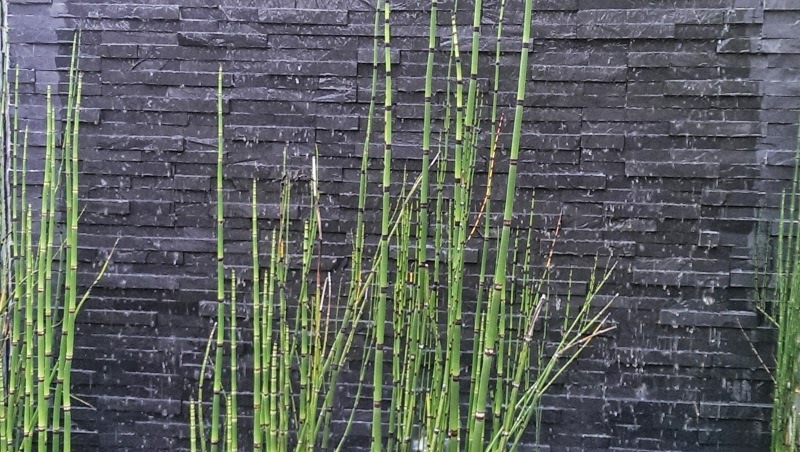 Planted with evergreen Equisetum hyemale and underlit with submersed low voltage LED lights, this focal point comes into its own at night. 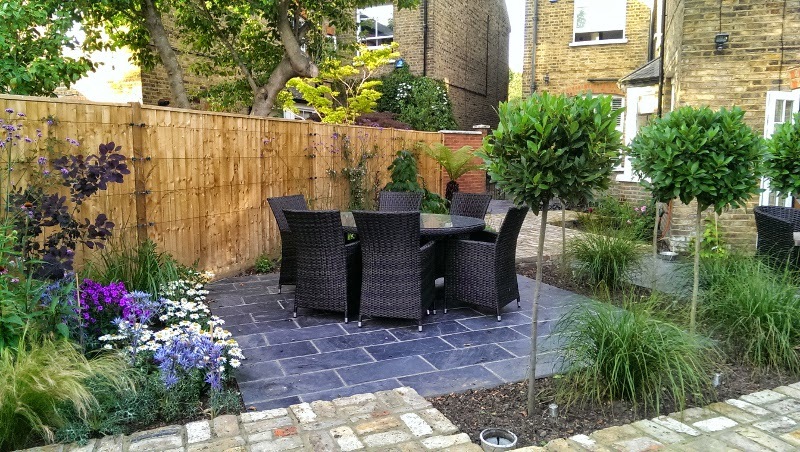 Seating for 6-8 was provided for in this slate paved dining area. The formal dining area was positioned close enough to the house for ease of access but far enough away for the area to be surrounded by lush planting that will continue to mature. 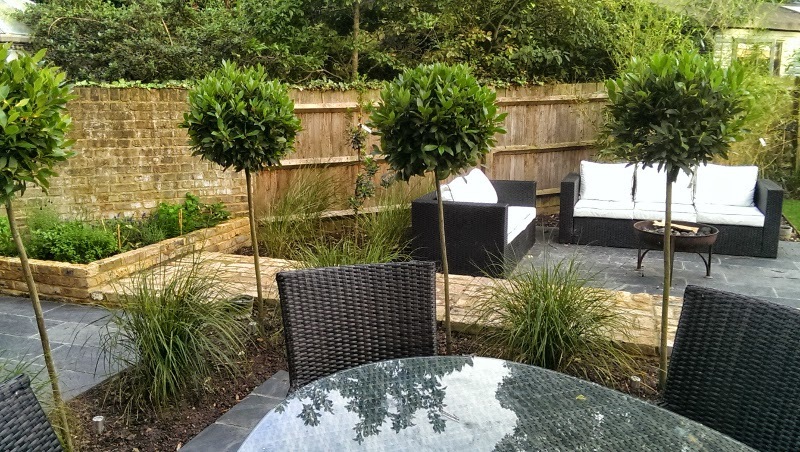 Standard bay trees underplanted with evergreen, medium sized ornamental grasses (Stipa arundinacea) surround this eating area. This, as the plants mature give a feeling of seclusion with glimpses of further garden areas. The clients for this garden design enjoy nothing more than being able to sit back together or with friends and appreciate a roaring real fire outside. 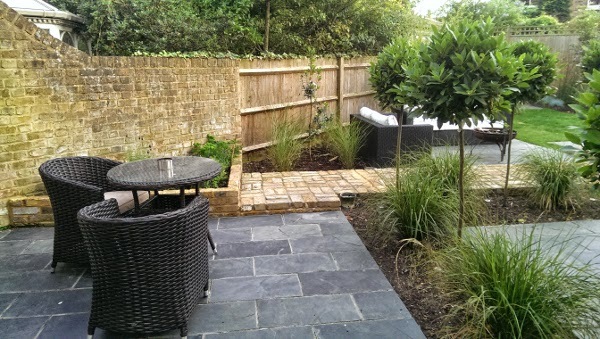 Planted on both sides with tall bamboo plants and tall ornamental grasses this area will mature into a lovely secluded spot. This area is linked to all others from the brick path and has a front seat view of the night lit water feature. 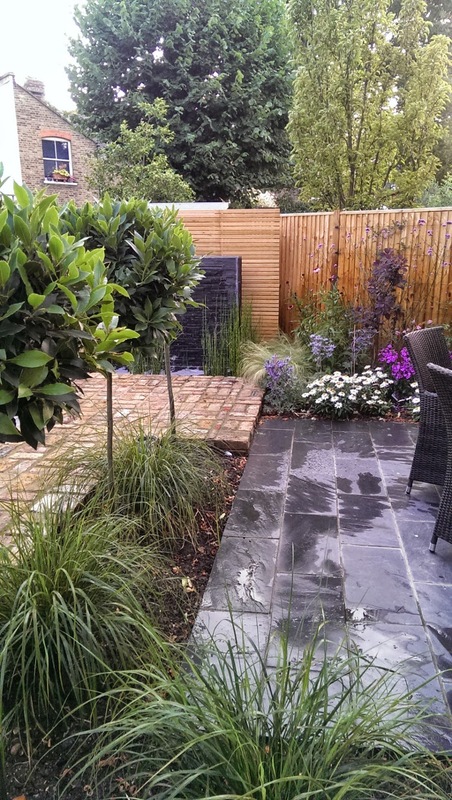 All properties experience areas of ‘dead’ space however with careful planning and design these areas can become perfect places for focal point planting whilst still being functional. Tree ferns have been positioned and under lit to be enjoyed from the kitchen. Heavily scented climbers, shrubs and roses have also been planted to enliven the senses in different seasons and to let those scents drift into the house in spring and summer.